I posted a little while ago about the EAC ATC Swap and how I was late getting mine in for the swap but that the wonderful host guild had managed to swap out most of them anyway. These are the four lonely little ATCs of my own that came back to me, from my Broken Dishes series. Would anyone like to swap for one of these? Once again, something totally different! Last night I made bath bombs... or are they bath fizzes?... from supplies in the stash. Very quick and easy! I ended up with a few of them and I think they will make great stocking stuffers. I gave dd one to take for a test drive and she reported back that they fizz beautifully when they hit the bathwater so I guess that means they work. I spent a little time the other night making up little bags of bath salts with lavender in them - they smell delicious! Why am I making bath salts? Back to the stash reduction! Although I have only made soaps, etc. a couple times, I have collected a quantity of supplies for doing so because I thought it was something I would enjoy. So, if I actually make all this soap, bath salts, bath fizzes, etc. I will have this group of supplies out of my stash, right? And I will have a lot of little gifts etc to give people or sell. Sounded like a plan to me! and have listed them on my Etsy shop! I'm not much of a knitter either so a couple knitting pattern books went in the shop. The booklets charmed me because of their age and graphics but they have to go! Eventually I will make a dent in all these accumulated treasures... Wish me luck! 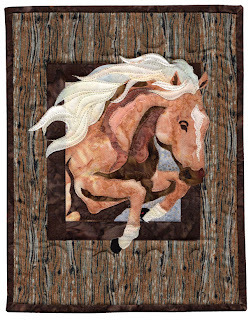 May AAAQI Auction Quilts are up! You might want to check out the quilts in the May AAQI online auction. Here are photos of a couple of them but it is worth clicking on the above link to see the rest. All 27 of these quilts are from the Priority: Alzheimers Quilt project. The AAQI online auctions are held during the first 10 days of each month, hosted by BenefitBidding.com. All profits fund Alzheimer's research. You can bid between May 1st and May 10th on these beauties. Have you ever been inspired by something you see and wanted to create it in stitches but wondered how to do it? I was up to catch the sunrise the other morning and I was so struck by the big ball of the sun peeking through the brush, I had to take some photos. After I cropped off all the extraneous stuff in the yard from the photo, I was pleased that the photo represented accurately what I was seeing - not always the case with sunrise or sunset photos. So, now the question is.... how can you create this with a needle and thread? The trees would not be too difficult since they all appear uniformly black in front of the sun. Creating the background is where the work would come in - a little ingenuity would be needed! After looking at these photos for a few days I have come up with ideas I think would work. I would paint the background to achieve the grey, yellow and orange areas. The sun itself is the part that had me stumped. I have finally decided that the orange layer would have to be some very bright fabric - a neon orange really. Then it would have to tone down all around so I think that layers of sheer could be used to do that, making them progressively lighter as the got closer to the sun itself, thereby graduating the colour.By cutting the sheer, you could also get the effect of the rays coming out from the sun I think. 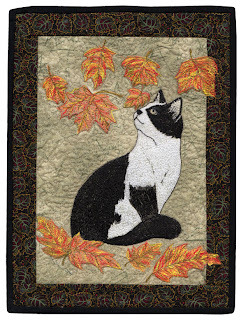 I took part in the Embroiderers' Association of Canada's annual ATC swap again this year. I made ATCs with a vengence but was late getting them in, however, the gracious ladies in the Peterborough guild did their best to swap out as many of them as they could. So, here's a shout out to the makers of the ATCs I received! This one is called "Firework" and was greated by Astrid of Nanaimo, BC. The glitzy bits really pop against the plush velvet of the background. Bonnie of Simcoe, Ontario, is a member of Norfolks' Own Needle Arts Guild and she stitched this lovely bouquet. If I might be a flower..."
"Merrimbla" came all the way from Vicki in Gurley, NSW, Australia! Susan in Cambellcroft, Ontario, made these adorable little fish. These skates came from Linda - I wish you could see them better in this photo to appreciate the glitzy thread she used with the sequins to add sparkle to the skating scene. This one is another from Deb entitled "Great Hearts Think Alike" - isn't it awesome?? These sparkly bugs - are they fireflies? 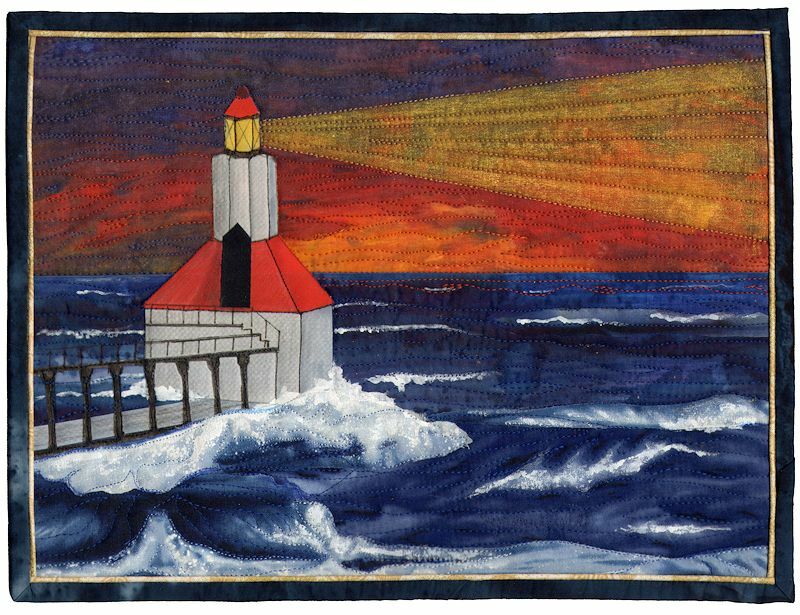 - came from Mary-Wyn of Simcoe County Embroidery Guild in Ontario. This one from Christine of The Tangled Threads arrived with it's button broken in the mail but I will find one just like it to replace the broken one so it keeps it's original design. "Remember the Last Penny" came from Carolyn in London, Ontario. This is so clever! To appreciate it, you need to know that the penny was discontinued from Canadian currency back at the start of February. What a great remembrance of a foresaken coin! You won't believe the title of this one: "First Try: Ribbon"! I am guessing that this is the first time Carol of Peterborough, Ontario, has worked with silk ribbon embroidery. You would never know looking at it, would you? Here is another button bonanza from Christine of The Tangled Threads. She must have a button collection like mine! Gorgeous or what?! "Violet" is the name of this little hardanger angel created by Barbara of Fredericton, New Brunswick. Last one from Linda in Peterborough. Talk about a field of flowers! Thank you to all the people who took part in the annual ATC swap at EAC and especially the ladies who made the ATCs I received. A special shout out to the wonderful ladies at the Peterborough guild who went to such lengths to swap out as many of my tardy ATCs as they could. You rock! Well, if bookaholic isn't a real word... it should be! I have very eclectic reading tastes which lean mainly towards non-fiction... any kind of non-fiction. Sometimes this words to my advantage. I took a course recently on an obscure type of lace - Carrickmacross Lace to be exact - and when I looked at home after, lo and behold, I actually had a book on it! Mostly, though, my inability to leave any stitching, craft, or fibre art book on the shelf in a store when it could be in my home is not a good thing, or maybe it is just too much of a good thing. So, step one in taming the stash monster is to get my book collection under control. The first step was donating three boxes of books to the local youth embroidery chapter. There are three boxes sitting on the porch right now waiting to go to the thrift store. Seven or eight boxes have already gone there. This is a bookshelf by my computer table... There are two more of these white bookshelves in my sewing room full of books. This bookshelf is down in the living room and it has all my Inspirations magazines, Piecework, A Needle Pulling Thread as well as more books! I gave lots of books away last summer to the local public library and they gave me a tax receipt for $1000.00+ so you would think that would have lessened the number left here. There are a total of five of these bookshelves in the library in my house. Yes, that is actually what we call that room! I have always liked the look of bookshelves that are half empty and have room for little knick knacks. Instead I have full bookcases with piles of book on top! ...and on pieces of furniture where books don't belong! Not just one chair either! I hope confession really is good for the soul - it would mean my soul is in really good shape after sharing these photos. There are three more bookshelves in the pantry with just cookbooks on them and still they are piled on the tables. So, what am I doing? Giving books to the library, giving books to the youth embroiderers' group, taking them to guild meetings and giving them away! And I don't think I have made a dent yet! So, now I am listing them for sale on Amazon. So far I have 475 listed! I have been spending a lot of time trying to figure out what happened to my muse during the last year and I have come up with some answers. For one thing, I have become overwhelmed with everything on my plate. I joined the Board of Directors of the Embroidery Association of Canada, which I love being a part of, but it seemed to be the straw that broke the camel's back. The added workload meant something else had to go and I wasn't willing to let it go - so I found myself overwhelmed. My daughter left for university this last year and having the last bird out of the nest had a much bigger impact on my state of mind than I expected. Empty Nest Syndrome? Me?! On top of everything else, I had an especially bad bout of seasonal depression this year and it lasted much longer than usual. Among other symptoms, it left me feeling unable to "do" anything. Instead, I thought about how much I had to do and sat and worried about it. Not very productive! There is added stress in my life lately with trying to help my daughter make ends meet at school, helping where I can with my son's family as he struggles to find another job, dealing with the loss of my job as a caregiver, which I loved, and other struggles. Retirement is looming in a few years and I still have a mortgage and bills to get rid of before that happens. Much as I love my seasonal work running a campground each summer, "living away" for four months of the year takes it's toll and I am trying to find work closer to home - hopefully with less physical work involved in the position. I am feeling too old and tired to continue "working like a man". Dealing specifically with my stitching, I have been totally obsessed with crazy quilting now for between 5 and 10 years, to the exclusion of all other stitching... For much of that time, I have been moderator of a large group online, Crazy Quilting International, which ate up the hours each day on the computer. I have been teaching crazy quilting, blogging about crazy quilting, co-running a crazy quilting group and spending time every day crazy quilting. I think burn-out was inevitable. At the same time, my stash has become overwhelming. Anyone seen Hoarders? I expect them to turn up at my sewing room door with a camera any day now! lol Besides crazy quilting supplies, I have continued to collect things for all my other interests - all forms of embroidery, many crafts, and an eclectic selection of books... My house overfloweth! - stepping back from the online group. No one is indispensable, including myself, so I needed a bit of distance from that particular obsession. - realizing that I need to diversify my stitching interests. I am knitting, embroidering, taking some classes in new techniques, and giving myself permission to take it easy and not push the envelope every waking hour. Embroidering a pillowcase is just as worthwhile as figuring out a new technique I can use on a crazy quilt block. - working on lessening the weight of the stash. More on that in a later post! So, that is where I am at! I have been negligent in my blogging, missing from action in CQI and spending a considerable amount of time feeling sorry for myself. Spring is coming, plans are in action, and my muse is tickling the back of my mind again at last (I hope). I actually walked by a cq block in progress the other day and had to add it to my bag to carry around with me - ideas started to peculate by themselves and I felt the need to have it handy when I had a few minutes to work on it. Progress! Somehow or other I seem to have gotten into a mood for finishing things. This doesn't happen often (ever?) so I am going with it while the mood lasts. This little porcelain dish has been in the stash for ages, as had the little bit of stitching. 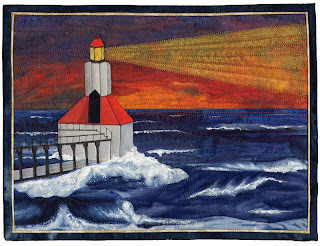 This is a piece I did for Tanglecrafts when I was model stitching for them. I love the stylized thistles in this geometric design and it fit perfectly in the dish lid - why didn't I ever put the two of them together before I wonder? Anyway, another item completed and I am well on my way to having all my gifts handmade for next Christmas. Well, here I go again - the non-knitter unable to resist a yarn! I hope you can get an idea from the photo of how irresistible these balls were - thick, soft, chenille like yarn. It is "super-bulky" which would mean something to an actual knitter. It drove me crazy! lol I tried to knit the simple pattern on the label for a baby blanket that was basically just an enlarged discloth pattern - the one where you start in one corner and work up to the widest part and then back to the far corner again with an eyelet edge. No way could I make it work! lol So, after ripping it out seven times I changed plans and worked a large square with a ribbed edge all the way around. (Flashback on the "potholders" my mother had me knitting 50 years ago!) It was my first time working with circular needles too which I have to admit I didn't like. But I have a baby gift ready for my daughter's friend who is due this summer so it's all good. Also, I managed to use up the stuff I bought instead of adding it to the stash so - double bonus! 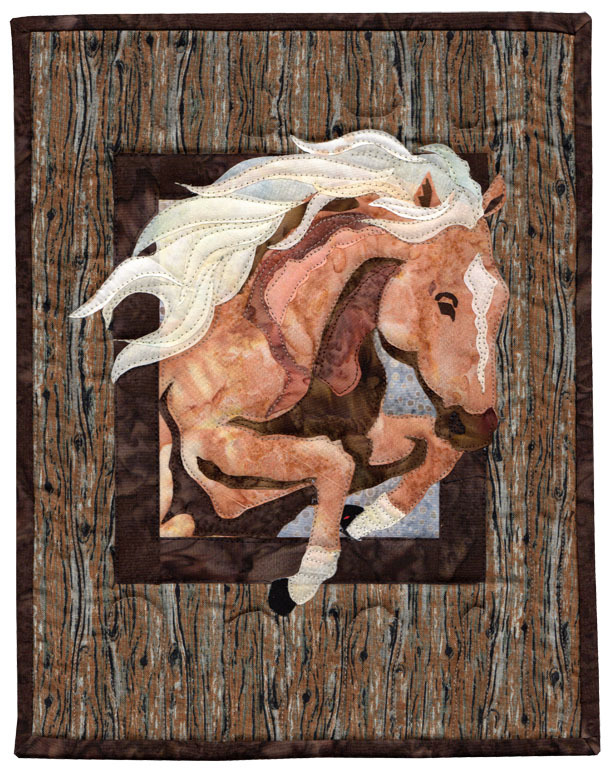 Fantastic Crazy Quilting in Latest "A Needle Pulling Thread"! The latest issue of my favourite Canadian stitching magazine, A Needle Pulling Thread, was in my mailbox this week. I had been waiting anxiously for this issue because I knew Grovenore Flato's crazy quilted teddy bear was being featured. I am proud to say Grovenore is an online friend and fellow Albertan. She has had some incredible crazy quilted items in the Calgary Stampede Exhibition in recent years and has lots of ribbons to show for it. Here is a little sneak peek of what you will see when you check out the magazine. There are four pages of wonderful close up photos of different views of Flora the Bear. In the article Grovenore shares how she made her. This bear is delightfully encrusted and I could just look at the photos all day long, always seeing something I hadn't noticed before - so many great details!